Text: Origins. 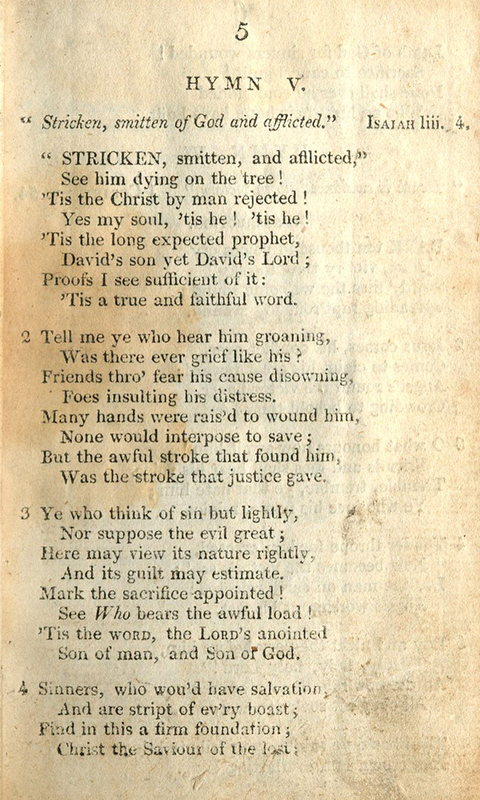 This crucifixion hymn by Thomas Kelly (1769–1855) was first published in his Hymns on Various Passages of Scripture (Dublin, 1804 | Fig. 1), in four stanzas of eight lines, without music. The hymn begins by quoting Isaiah 53:4, but then is presented from the perspective of a bystander observing the events of the cross. Fig. 1. Hymns on Various Passages of Scripture (Dublin, 1804). Fig. 2. Hymns on Various Passages of Scripture, 2nd ed. (Dublin, 1806). In the third edition (1809 | Fig. 3), Kelly’s revisions were more significant. He made one small change at stanza 3, line 4, from “And” to “Here,” but the biggest changes were to the fourth stanza, where the first four lines were reordered and recast while keeping the same rhymes. Fig. 3. Hymns on Various Passages of Scripture, 3rd ed. (Dublin, 1809). This form of the hymn was repeated in all subsequent editions, through the seventh and last edition of 1853. Is it nothing to you, all you who pass by? Furthermore, Idle wrote, “The argument of stanza 3 is that of the preacher who points out that sometimes we realise the weight of a load only when we see the vast machinery required to lift it.” In stanza 4, Christ’s attribute as a foundation, a cornerstone, comes from passages such as Isaiah 28:16, Psalm 118:22, and elsewhere. John the Baptist was the first to refer to Christ as the Lamb of God, in John 1:29-37, and this name is prevalent throughout Revelation, but the imagery goes back to the sacrificial lamb of Genesis 22. Tune. This text is most often set to O MEIN JESU, ICH MUSS STERBEN, a German tune first published in Geistliche Volkslieder [Spiritual Folksongs] (Paderborn, Ferdinand Schöningk, 1850 | Fig. 4). In that collection, the song was marked as having been acquired orally (from oral tradition) in Paderborn. Fig. 4. Geistliche Volkslieder (Paderborn, Ferdinand Schöningk, 1850). 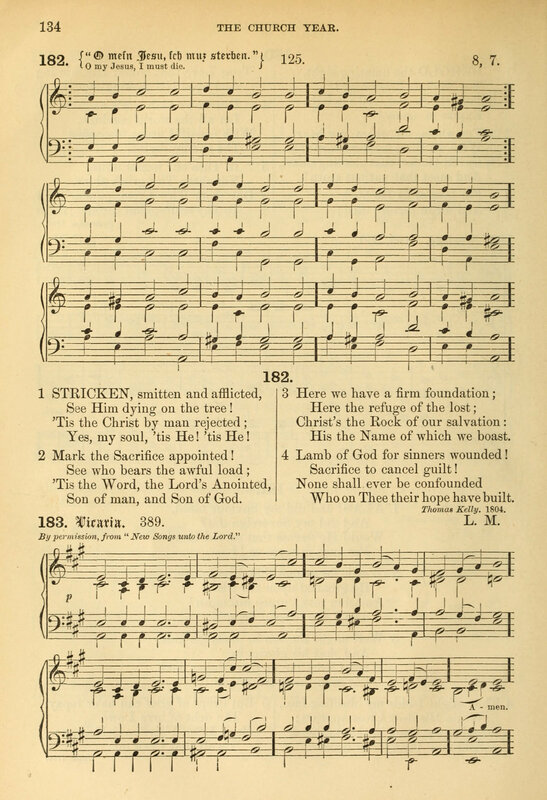 The tune seems to have been adopted into English hymnody, paired with Kelly’s text, in the Church Book for the Use of Evangelical Lutheran Congregations, with Music (Philadelphia: Lutheran Book Store 1872 | Fig. 5). The minor tune is appropriate for Kelly’s text, and the original German text (“O my Jesus, I must die”), which has apparently not been translated or adopted into English hymnody, has a similar macabre tone. Fig. 5. Church Book for the Use of Evangelical Lutheran Congregations, with Music (Philadelphia: Lutheran Book Store 1872). Christopher M. Idle, “Stricken, smitten, and afflicted,” Exploring Praise!, vol. 1 (Darlington, England: Praise Trust, 2006), p. 312. W.G. Polack, “Stricken, smitten, and afflicted,” Handbook to the Lutheran Hymnal (St. Louis: Concordia, 1942), p. 120.